Two and a Half Canadians in Cambridge: Our Friends are Cooler Than Us. . . Or Are They? I talk often about our "Cool Friends" Nikki & Alex, and our "Cool Friends in London" Alex and Naomi. We think they are cool because (a) they are, but mostly (b) they don't have kids, and so can do cool things whenever and wherever they want. We sometimes suffer from nostalgia to our child-free days, and say things like, "Remember when we had two incomes and could do awesome stuff like eat out 6 nights a week and buy new clothes every month?" or "Remember before Elizabeth was born and we could sleep in every weekend??" or "Remember before we had a baby and we never, ever worried about what we were going to have for dinner or when dinner would be?" But for whatever reason, they are still friends with us - even though we don't buy new clothes as much, or sleep in past 8, and we start planning dinner at 11 am. 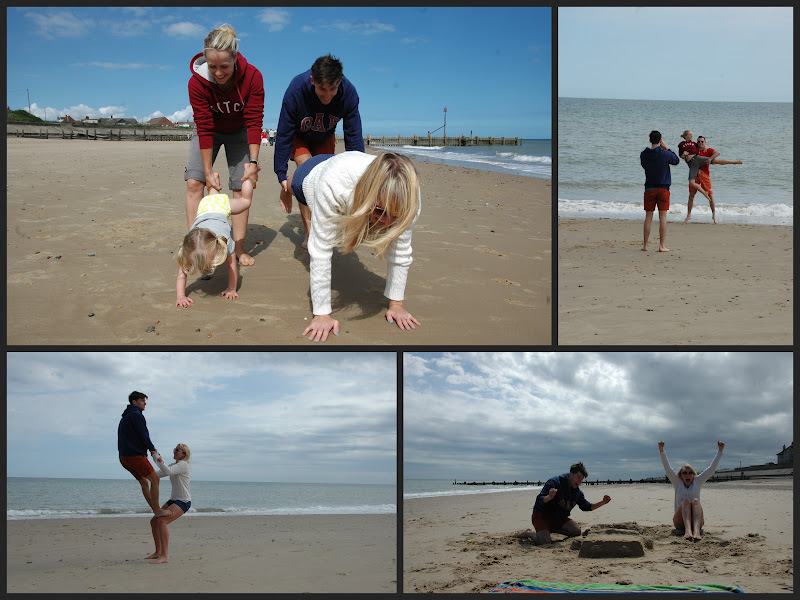 Alex & Nikki recently came with us to the seaside - it was right after Adam & Suzie were in Cambridge (photos coming soon!) and just before the Babowals were due to arrive in the UK (even more photos coming soon!!). We went away to the seaside for a quick holiday - in British: a mini-break. I think that is the cutest name for a weekend trip. At one point, Alex said he'd brought a kite, and wanted to get down on the beach because the windy condition was perfect. Matthew responded, "Awesome! Elizabeth loves kites!" Elizabeth immediately started singing, "Let's Go Fly A Kite" from Mary Poppins. But when we got to the beach, it wasn't just a 'kite' - it was a huge, parachute-like, wind-surfing awesome thing that caught the wind and lifted him off the ground. Yeah, how cool is that? I know. Matthew & I were expecting this dinky diamond-shaped kite with a tail of ribbons, and boom! He is flying with his kite. So you can imagine how we felt watching him. The only thing going through my mind was, "Why are they friends with us ???" And then I remembered the day before, when Matthew & I were practicing our Cirque Du Soleil moves on the beach, and they participated with their counter-balance awesomeness. And how they'd made Elizabeth a sand-car to drive in, and then did multiple themed-photos with their car, including "Success!" as shown below. 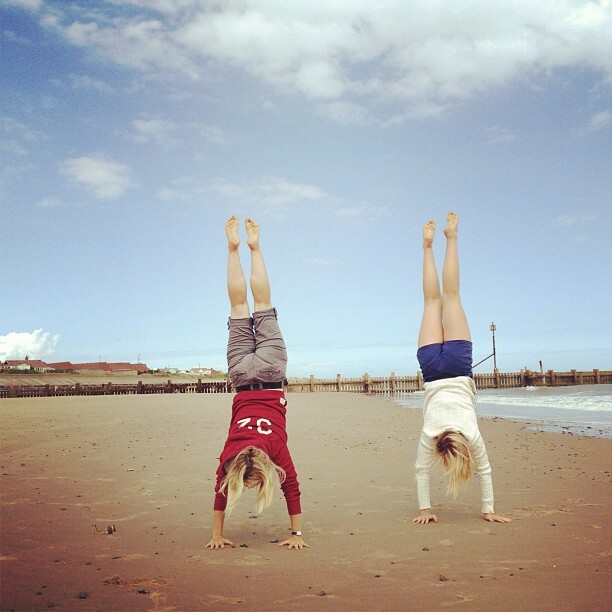 Nikki & I also decided to enter the Olympics in Rio 2016, with our phenomenal synchronized headstands. We are going to knock the socks off the judges. So maybe no one is as cool as we think they are. Except Alex & Naomi in London - they're pretty cool. Maybe we just need to get them to the seaside to see their sand-art and acrobatics. More photos of the weekend here.